Amanda Nunes celebrates after she made quick work of Miesha Tate at UFC 200. 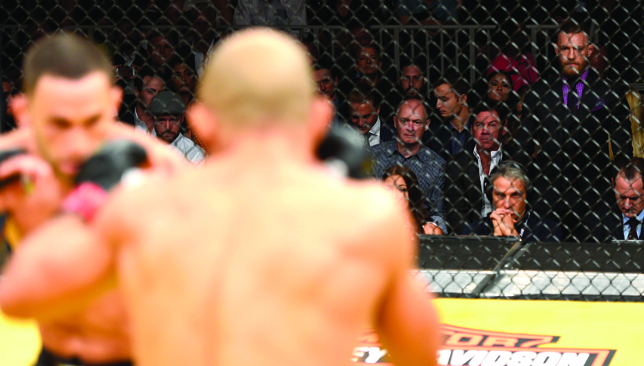 Conor McGregor stares as Edgar and Aldo do battle. Conor McGregor has already sent a message to Jose Aldo, and he didn’t need a single word to convey it. The Brazilian dismantled Frankie Edgar to become a UFC champion once more, claiming the interim featherweight title via unanimous decision at UFC 200 Saturday. And the man Aldo will undoubtedly face next was stood stalking in the shadows of the Octagon, watching and waiting as a rival to his 145lbs throne emerged. Indeed, McGregor was the man UFC 200 wanted to forget after he was booted from the card for his reluctance to fulfil media obligations. But with one icy-cold stare in the backdrop of Aldo’s victory, he sent a chilling reminder that he will be back. Of course, he is currently embroiled in another rivalry with Nate Diaz, which could come to a close at UFC 202 in August, but after that a rematch with the man he knocked out in 13 seconds will be next. That may well be the case as Aldo, one of the greatest featherweight MMA fighters of all time, put in a stellar performance to negate the dangerous attack of Edgar. While ‘The Answer’ was clearly the more active fighter, Aldo stayed on the backfoot and timed his counters to perfection, bloodying Edgar’s nose and controlling the fight. Just like in their first clash, at UFC 156, it went the full five rounds but in contrast the Brazilian did not fade in the later rounds, instead growing with confidence as he picked off a frustrated Edgar on his way to a vital victory. Elsewhere, Daniel Cormier was bizarrely booed by those inside the T-Mobile Arena after he scored a one-sided win over Anderson Silva. For a man who should have been considered a saviour of UFC 200, he was instead painted as a villain. The light-heavyweight champ was initially due to take on Jon Jones until the latter failed an out-of-competition drugs test. Cormier remained on the card and Brazilian legend Silva stepped up on two days notice. ‘DC’ used his smothering ground game to nullify the menacing striking of the middleweight great. And clearly the fans were hoping for a more reckless strategy. Some people it seems, just don’t understand the sport either. In the co-main event, Brock Lesnar beat Mark Hunt with a unanimous decision as the former champion won over all three judges. The former champion boasted his fine wrestling skills in the much anticipated fight and nullified Hunt’s attacks. Lesnar certainly made the most of the WWE’s “one-off opportunity” grant to let him compete at UFC 200. Elsewhere, Amanda Nunes took the women’s bantamweight championship from Miesha Tate. Nunes knocked Tate to the ground and earned a submission win in the first round. Daniel Cormier beat Anderson Silva in convincing fashion as he picked up a unanimous decision. Jose Aldo also enjoyed a unanimous decision win over No2 ranked featherweight Frankie Edgar for the interim featherweight title. Joe Lauzon’s KO against Diego Sanchez bumped to fifth on the UFC’s all-time finishes list. Lauzon knocked out Sanchez in Round 1. Meanwhile, No1 ranked bantamweight TJ Dillashaw won by unanimous decision in his rematch with Raphael Assuncao. Sage Northcutt took away a grueling unanimous decision win over Enrique Marin.